And for all of the complainers who say you can't use third-party headphones, chill out: the shuffle starts playing automatically when you turn it on. So, when is apple going to make me learn Morse code in order to push the button just the right way in order for me to get what I want? Doesn't matter much to me, I already know Morse code. niiice. So why are there two different voices for PC and MAC? Is the make voice sexier so people will buy macs instead of having to hear the crappy PC voice? Or is the PC voice embedded with subliminal messaging telling people to buy mac buy mac buy mac! It's actually nothing that devious. The Mac voice is the one built into Leopard, and it's not available on other platforms. It just happens to sound better, so we decided to use it where it was available. Great, so it starts playing when I turn it on. But I still can't adjust the volume. This is very bad, and will definitely keep me from buying one. Unless, that is, Apple makes good noise-canceling headphones *cheap*, then I might consider it. It's true that playing without volume or playback controls is far from ideal, but least there's a mitigating factor. Having said that, mitigation isn't the same as perfection, and incompatibility with non-Apple headphones is currently the new shuffle's biggest drawback. Things will get better over time, since many companies will add the iPod remote to their products—maybe even a cheap pair of noise-canceling headphones. 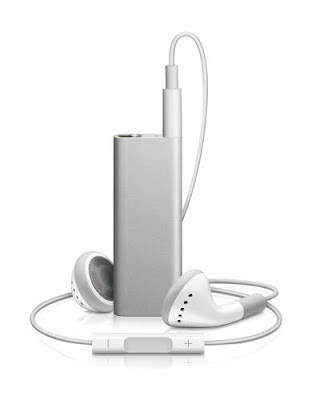 There's also the option of using a soon-to-appear remote adapter with your existing headphones. nice post bruce. I had a great time in SF. Keep on keepin' on! I told you that people wanted buttons on their ipod.